The Bahiazul Villas & Club Fuerteventura is a fabulous 4-star property ideal for guests wanting a peaceful escape amid intimate surroundings. All the villas boast vibrant, bright colours, making them an appealing place to stay. The outdoor area of the villa comprises a jacuzzi and a swimming pool, plus a serene rooftop terrace with comfortable sofas and a four-poster Bali bed - perfect for a day spent soaking up the sun. The facilities at the luxury Villas & Club Bahiazul include a spa, fitness club, bikini club terrace, restaurant and the villas are complete with modern en-suites, a kitchen, lounge area, music systems and more to ensure ultimate comfort for its guests. The hotel offers both bed and breakfast and half-board facilities, so guests can enjoy a buffet-style breakfast and/or dinner in-house. Fancy a day out? The hotel is close to a sandy beach and there’s an abundance of adventure activities to partake in in and around the local resort, from watersports to island boat trips and horse riding. 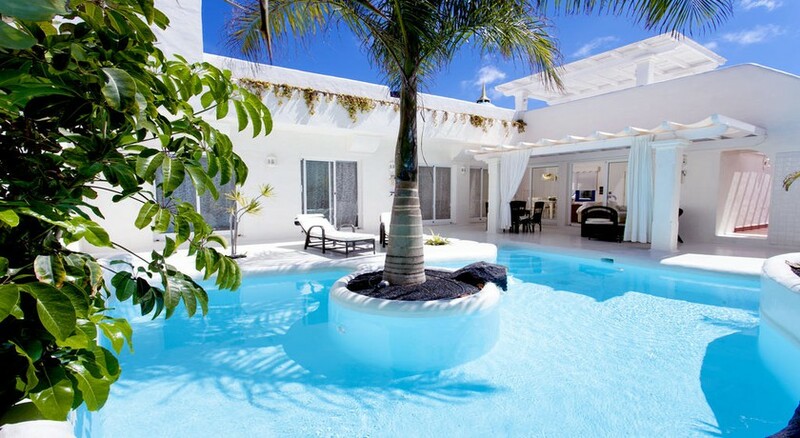 The Bahiazul Villas & Club Fuerteventura is situated in Corralejo Las Palmas, Spain. It's close to numerous places of interest, historical attractions and shopping centres including Playa De Sotavento (108km), Betancuria Town (46.7km), horseriding on the beach (15km) and much more. The Fuerteventura Airport is at a distance of 37.9km, which is not too far for the guests to travel. As the name of the hotel suggests, the guests have three different kinds of villas to choose from, which each have a maximum capacity to accommodate up to six people. They are categorized as Superior Club Villas, Premier Garden Villas and Royal Villas. Although the amenities in these villas differ, their space is almost the same with three bedrooms, three bathrooms, guest toilet, fully-equipped kitchen and a living room. They all come with necessary and luxury amenities such as an outdoor pool, jacuzzi, Balinese bed, tropical garden, hot tub, sound system, interconnecting door, great luxury furnishings, free WiFi, coffee machine, tropical garden, TV in the living room and bedrooms, exclusive royal villa furniture (in Royal villas) and much more. The hotel features a buffet restaurant named Restaurant Bahiazul. It offers buffet breakfast on the terrace, which includes Mediterranean, continental and English influences. During breakfast, you can enjoy pastries, pancakes, freshly prepared crepes, serrano ham, eggs (scrambled, boiled, poached, etc.). In addition to these, you will also find cooked meats such as sausages, beans and bacon. The restaurant also has a diet corner where all the sugar-free products are kept. If required, the restaurant also offers gluten-free items. The dinner setting in the restaurant is absolutely stunning with an extraordinary buffet. The hotel’s staff members will provide you personalized service and will take care of your holiday needs. If you want to explore more, then there are many bars and restaurants within close proximity to the hotel, too. The Bahiazul Villas & Club Fuerteventura is the best place to stay if you want ultimate leisure. Pamper yourself at the on-site spa, or fitness enthusiasts can hit the fully-fledged fitness club complete with a variety of equipment. Swim in the pool, lounge on the Bali bed or head out of the hotel and discover what the island has to offer, with watersports, boat trips, culinary tours and more.